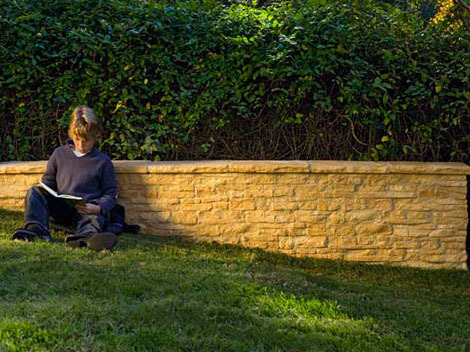 Recreate one of the world’s most famous retaining walls in your very own back yard with Boral’s Hadrian Wall. This retaining wall system achieves a classic look in true sandstone hues. Demonstrating it’s versatility, the Hadrian Wall can be used to construct straight and curved designs, from retaining walls to water features,. Hadrian Wall includes several different face patterns to create a random, stacked stone appearance for walls up to 490mm high. This premium double-sided retaining wall block is lightweight and easy to install. It is suitable for DIY goers. For the irregular joints of Hadrian Wall™, Boral recommends using new Geo-Fix™ joint mortar. To locate your nearest Boral stockist, to receive brochures or to learn more about our products, call 1300 134 002 or visit our website at www.boral.com.au/retainingwalls.